Taste test: The first thing that I noticed about these was that they came in a really big bag — 18 ounces, and all for just $2.99. The next thing that struck me once I poured the bag into a bowl was just how big the chips were — they were large, unbroken and quite impressive. As for taste, they're pretty good chips, with a different flavor than other potato chips — different also from other kettle-cooked chips. You can taste a lot of potato, without very much much salt, and they do have a good crunch. 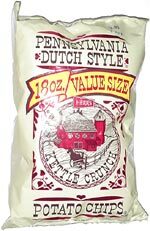 People from Philly seem to have almost universal praise for Herr's chips. 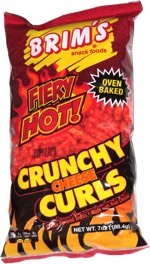 Trivia: You can fill up a chip bowl three to four times from an 18-ounce bag. This snack was discovered by Marlo.